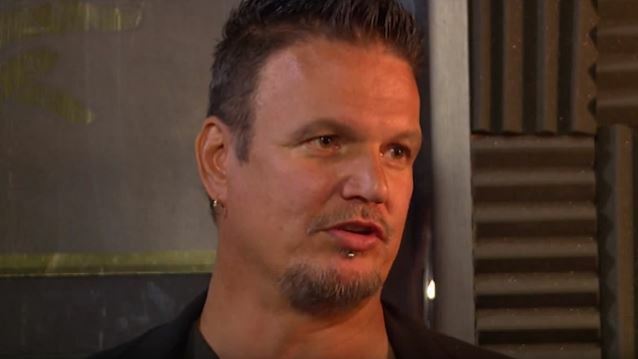 In a brand new interview with Metro, DISTURBED guitarist Dan Donegan talked about his family situation and how the band's recent four-year hiatus affected his personal life. "I have two kids, and my daughter's twelve and my son is eight now," he said. "The [hiatus] has given me time to go home and I was coaching football for a year. I'm not too proud to say, we were undefeated and won the Super Bowl that year [laughs] though I was one of eight coaches, so I can't take all the credit. But end of the day, we had that void of not having the stage anymore and the bottom line was that we missed DISTURBED. This is our baby, too, and once we got back to it, we realized how much we missed it. Asked if any of the other kids' parents knew that he had this second life as a metal star, Dan said: "In my hometown, there are quite a few people who know I'm around, but when I'm in the field with my 8-year-old, I'm wearing a different hat. I'm a coach and a dad." Donegan, who used to work for his father's construction company, a union job that paid well, said that his kids keep him "grounded" because they see him as "their dad who embarrasses them all the time." He added: "They've come on the road with us before and as much as they love my being in the band, it doesn't impress them because I'm still just that dad that's a dork to them." DISTURBED kicked off a North American tour — its first in more than four years — on February 10 in Fargo.